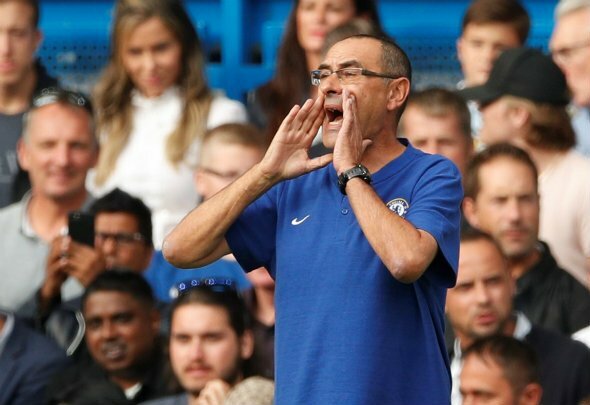 Maurizio Sarri is predicted to make three changes to his starting line-up ahead of Chelsea’s clash against West Ham at Stamford Bridge on Monday night. Antonio Rudiger, Ross Barkley and Gonzalo Higuain could all return to the side after being rested for the win over Brighton last week. Their returns might mean that Andreas Christiansen, Ruben Loftus-Cheek and Olivier Giroud are dropped for the London derby showdown. Kepa Arrizabalaga is very likely to start in goals behind a back-four of Cesar Azpilicueta, Rudiger, David Luiz and Emerson Palmieri. According to BBC Sport, Marcos Alonso is an injury doubt so Emerson could keep hold of his spot at left-back after a solid display against Brighton last Wednesday. Jorginho and N’Golo Kane could be joined in the centre of midfield by 25-year-old Barkley amid doubts about Loftus-Cheek’s fitness after it was reported that he has suffered a back injury. 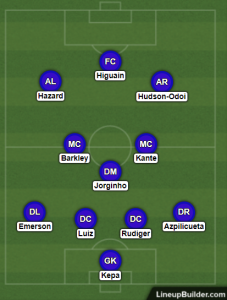 Eden Hazard and Callum Hudson-Odoi are predicted to keep hold of their spots on the wings while Higuain might come in to take Giroud’s starting spot up front, despite the ex-Arsenal forward getting on the scoresheet against Brighton. Chelsea can move up to third in the Premier League standings if they beat West Ham on Monday night. Sarri’s side is currently one point behind third-placed Tottenham, who did not have a game to play over the weekend.